We all know that sticking to an exercise regime or breaking a bad habit such as smoking and establishing a new one seems like a daunting task. Researchers at the University of Washington found that about 63% of people who made New Year resolutions were still keeping their resolution two months later. It's definitely not going to be easy, but it's not impossible and there are ways to increase your willpower to stay resolved and achieve your goals. Focus on "first things first" - In order to win a promotion or lose weight, all on the same day, is unrealistic. It's important to first establish one clear, specific goal and devise a realistic stratagem to achieve it. Sometimes, extra willpower requires extra energy, so don't push yourself too much. Focus on one goal at a time. Start Slow - One's momentum builds gradually, don't expect to achieve results overnight. Real achievement takes time. For instance, if you're trying to kick a caffeine habit, start by replacing your morning cup of coffee with a glass of fruit juice or water, instead of vowing never to drink coffee again. Take notice of the small achievements that will pave the way towards a larger one. Have a support network - You can join a support group or an organization related to your goal and interact with others working towards the same. This will help you get valuable advice, understanding and information, all of which will increase dedication and willpower. Change your environment - If you can, alter your environment to diminish temptation or encourage positive behaviour. For example, if you've been trying to get in shape, you can keep an extra set of workout clothes at your workplace as a reminder to stop by the gym on your way back home. 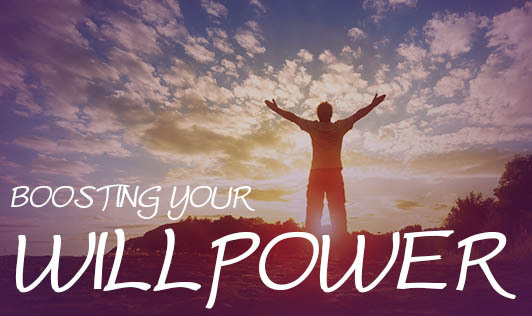 Something more than willpower - At times, changing your behaviour requires more than just willpower. If you are someone fighting an addiction or want to make a substantial lifestyle change, seek support and guidance from a professional. A professional will be able to provide support and follow-up or even prescribe medications if required to reduce physical symptoms. Don't beat yourself too hard, anticipate roadblocks and remember that a fallback only makes it more likely that you'll accomplish your goals!